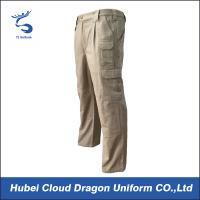 Home Companies Hubei Cloud Dragon Uniform Co., Ltd. These pants have pockets located for easy access to all of your gear. Made of lightweight 65% polyester and 35% non-fading poly-cotton, you have a pant that is extremely functional and maintains a neat, clean and professional look. Formal workwear design for police officers, special operations operators and military personnel. Material options:100% polyester, T/C poly/cotton,Ripstop,Twill,100%cotton and so on. We can embroider or print logo in products.